Sonam was young of course, but this does not tell the story of just another young lad! Sonam did fall in love with Sarika, but this is not just another candid love endeavour! It all happened in an Engineering College Campus, but still it's not just the tale of another Campus. Sonam, who had his own dreams and vision, came from the Land of Bhutan to India to pursue Engineering. A Buddhist (both by birth and faith), a little philosophical too, but the reader is not given a philosophical treatise on Buddhism. Intriguing is history, while its chapters unfold;yet rumour it was,till it stood untold"
An excursion of Insight is not just another book. It is about innocence and how our society murders it. It is the story of a system that changes you , if you try to change it. Harsh Agarwal, who was just 19 when he wrote this book , has done a commendable job . The love affair between Sonam Dorji and Sarika is sweet , however, not exceptional. The love story is but a phase of Sonam's life that leads him towards his destination. The circumstances surrounding the protagonists life, push him towards a realization and before we realize , involuntarily , Sonam sets off on a life altering odyssey.The destination of this odyssey can only be reached after one has battled the vagaries of life. I am of the opinion that the ending was kind of abrupt and the twists were foreseeable. Editing could have been better. I did spot some spelling and punctuation errors.The love story becomes boring after a point. May be because there is nothing extra ordinary about it. Apart from that , the imagery and description of the situations , have been jotted down with such ease and perfection that it brings the book to life.One good thing about the book is that you can somewhere relate yourself with the characters of the story. (More so , if you are an engineering student :p). There is a striking touch of reality.After reading the title, if you are expecting the protagonist to set off on a literal journey , with his bagpacks , then you will be disappointed. It is a journey , for sure. Sonam will take you on a philosophical journey. Read this book for Sonam , his innocence is rare and his questions , thought provoking. Isn't accepting and not raising your voice against evil a greater sin ? Are we all , by doing so , not fueling the malice and corruption named fire that is eating up the society ?" This and many more. An excursion of Insight , coming from the kitty of a young author , is simple and straight from heart.An easy one time read. 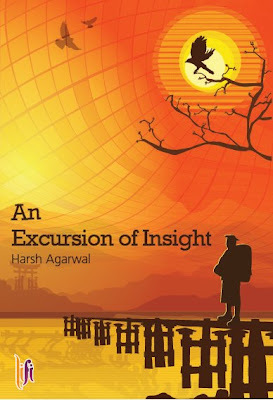 Harsh Agarwal is a young writing enthusiast who made his debut in the publishing industry at the age of nineteen. An excursion of insight is his second novel. Harsh, basically a third year Mechie from NIT Assam, always aims to present out of the box stories. He is a voracious reader, a professional freelancer, and a book-reviewer as well. He currently owns a literary organization Asylum (www.theasylum.in) which is dedicated to aspiring authors. He is also the project head for Times Lost Atlas (anthology of short stories) and chairperson of a charitable project, Project Humming Bird. Apart from writing, Harsh finds interest in music, travelling and networking.